Few wildlife enthusiasts can resist Africa. Few of its visitors fail to fall under its spell. Its wide sun baked landscape, huge skies, and simple, friendly people offer a warmth and calm welcome that are the quintessential ingredients of the classic holiday. The bold and colorful bird life and wildlife of the African continent, culture, mountains, plains, lakes, rivers, and valleys, unrivaled abundance and variety of its wild animals underline its status as the world’s top destination. During this safari, you will be staying at various accommodations across Kenya. After picking you up from the hotel, the team will let you have some relaxation after an exhausting journey at the Emin Pasha Hotel. It is Kampala's first boutique hotel. Gracious and elegant, the Emin Pasha Hotel evokes another era when taste, gentle service, ambiance, and comfort were the hallmarks of a good hotel. They have created a harmonious balance between old and new. Tradition blends seamlessly with contemporary, from the architecture to the furnishings. The rooms each face the beautiful, lush gardens or courtyards. All have en-suite bathrooms with either a slate-tiled tropical shower or deep long bath. All rooms are air-conditioned with Wi-Fi internet access, flat screen television, direct dial telephone, coffee-making facilities, mini bar, mosquito nets over the beds, and two complimentary bottles of drinking water. For nights two and three, you will be staying at Paraa Safari Lodge. The lodge is in Murchison Falls National Park. It offers a unique blend of comfort, relaxation, and adventure. Each of the rooms is a haven of style and serenity, complete with a balcony and private bathroom. The lodge has a swimming pool, restaurant, bar, gift shop, business center, and it also has conference facilities. The choice of accommodation at the lodge varies among cottages, suites, double, twin, and single rooms. In the standard rooms, you will find a simple safari atmosphere with a level of comfort that will not disappoint. These rooms are perfectly situated to view the lodge’s swimming pool, as well as the winding River Nile beyond. Enjoy your fourth and fifth overnight stay at Kibale Guest Cottages. These are private, unique, and luxury cottages located 36 kilometers on Fort Portal, Kamwenge road, adjacent to Kibale National Park in western Uganda and offer a spectacular view of low moist tropical forest, a few hundred meters from the park's main tourist center of Kanyanchu. For nights six and sevn, you can have the perfect and relaxing atmosphere at Mweya Safari Lodge. The lodge offers visitors an unforgettable experience. Located on a peninsula within the heart of the Queen Elizabeth National Park, Mweya Safari Lodge is surrounded by the magical Rwenzori Mountains aptly described as the "Mountains of the Moon." They have two standard rooms, 12 deluxe rooms with air-conditioning, and two suites. For those guests seeking the ultimate in privacy and exclusivity, Mweya Safari Lodge offers numerous configurations of cottages to suit your needs and requirements. Families may be more comfortable in the affordable family cottages. For those demanding something more luxurious and exclusive, the Queens Cottage and the Presidential Cottage will be sure to meet your demands. Have a good night's rest after your eighth and ninth safari adventure at Gorilla Safari Lodge. The lodge is an up market facility tucked away at the boundary line of Bwindi Impenetrable Forest, home of the endangered mountain gorilla. 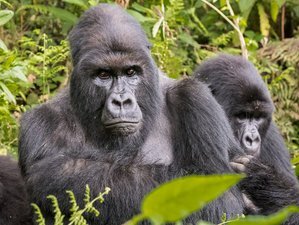 It is the ideal base from which to trek the Nshongi group of Gorillas, the biggest group ever habituated. The lodge offers accommodation in eight, en-suite, spacious, and luxurious units with individual verandas allowing excellent views towards the pristine, tropical rain forest. All bathrooms have hot and cold running water and flush toilets. The camp is composed of a main lodge which includes a restaurant, bar, lounge, and campfire overlooking the tropical rain forest. You will feel on top of the world from your first gaze across the landscape that will simply take your breath away. Your tenth and eleventh safari overnight stay will be available at Rwakobo Rock, an eco-friendly, family run hotel and restaurant nestled on a scenic outcrop at the edge of Lake Mburo National Park. Rwakobo Rock is a peaceful and secluded retreat where you can breathe in the essence of wild Uganda. The eight comfortable and spacious cottages are dotted around the hill, all very private, and offering great sunset views. The main dining area overlooks an expanse of rock that adjoins the park. It is set in the pristine Ankole ranch lands surrounding Lake Mburo National Park. Whether you want to sit back, sip on an ice-cold drink in a hammock, or head out into Lake Mburo National Park for a day of exciting exploration, there is something for everyone. Rwakobo is nestled on a scenic outcrop with breathtaking views. Animals such as zebra, warthog, impala, and bushbuck abound around the lodge and often congregate at the water hole beneath the dining area. At night, the sounds of bush come to life and allow your imagination to run wild. Rwakobo offers private thatched cottages, with solar lighting, flush toilets, and solar heated showers which blend into the natural landscape. They also provide guests with real comfort and luxury that does not cost the earth. They also have self-contained rooms available in the newly built Hornbill House. The beautiful thatch building has five bedrooms each with their own en-suite and veranda. For a more basic bush experience, they also have their lazy camping safari tents. At the very heart of Rwakobo Rock is the owners’ dedication to supporting and preserving the surrounding pristine wilderness of the Lake Mburo ecosystem. With this in mind, environmentally-friendly technologies such as rain water catchment, solar power, solar water heaters, and solar refrigeration are all used to ensure responsible tourism. After breakfast, you will drive north of the country to Murchison via Ziwa Rhino Sanctuary in Nakasongola to track the rhinos. In Uganda, rhinos were depleted in the early 1980s, after a period of civil war and severe poaching. The sanctuary has now been established to breed black and white rhino in phase one and two to restore Rhino populations in Uganda so that they can be re-introduced to their natural habitats. You will then have lunch at the sanctuary or Masindi before proceeding to Murchison. You will have dinner and then enjoy your overnight stay at Paraa Lodge. After breakfast, you will go for an early morning game drive where you may have chances of viewing lions, giraffes, hartebeests, buffaloes, elephants, Bohor reedbuck, as well as many of the other mammals of the park. For the bird lovers, you can come across the Sported Morning Thrush, silverbird, Buff-bellied warbler, Black-headed batis, Black-headed gonolek, Vitelline-masked weaver, Green-winged pytilia, Blue-naped mousebird, Secretary bird, Black-chested snake eagle, Tawny and Marshal eagles, Northern and Southern Carmine bee-eaters, and many others. In the afternoon, you will go for a boat trip to the foot of Murchison Falls where the Nile thunders through a small seven-meter gap or down the river to the delta where the Nile empties into Lake Albert. The banks of the Nile are home to many species. You may see huge Nile crocodiles, hippos, and other wildlife that may come down to drink from the river. You will have a tasty evening meal before retiring back to your lodging. After breakfast, you will depart Murchison Falls for Kibale Forest National Park. This park is known for the highest number of primate species in Africa. The activity starts in the morning hours and there is also another lot for the afternoon, depending on the time of your booking and itinerary. When trekking chimpanzees, you may come across other primates including phoestes, red-colobuses, blues, red-tailed, and grey-cheeked Mangabeys in the canopies of the dense forest. You will also spot birds, butterflies, and many small insects. The guides provide explanations about primates and other forest's fauna and flora, ensuring that your walk is both informative and enjoyable. You will have dinner and an overnight stay after such a fun day. In the morning, you will go for a chimpanzee tracking in the forest. Later in the afternoon, you will go for a guided walk through Bigodi Swamp. The wetland is managed by the Kibale Association for Rural and Environmental Organization formed in 1992 with the aim of achieving social and economic development for local communities. The swamp is a home to about 137 bird species. Immerse yourself in a hearty meal and relax in your room afterwards. After breakfast, you will drive to Queen Elizabeth National Park, arriving in the afternoon. For the sixth day, you can relax at the hotel or go for a late evening game drive. Enjoy your dinner and your overnight stay at the lodge. In the morning, you will have a game drive to the Kasenyi area to look for lion prides and other wildlife like the waterbuck, Oribi, and Uganda Kob that mate around the area. You will return to the lodge for breakfast. Queen Elizabeth is Uganda’s most popular and certainly one of the most scenic safari attractions. It stretches from the crater-dotted foothills of Rwenzori range in the north, along the shores of Lake Edward, to the remote Ishasha River in the south. It incorporates a wide variety of habitats that range from savanna and wetlands to gallery and lowland forest. This gives the park the diversity of bird species of over 550 and a list of 95 mammal species. You will then go for an afternoon boat trip along the Kazinga Channel. There hippos huff and spray mere feet away from the boat, buffaloes linger in the shallows, and a tremendous variety of birds grace the grasses on the shores. Great White and Pink-Backed pelicans, Great and Long-Tailed cormorants, Open-Billed storks, African jacanas, and Malachite and Pied kingfishers are commonly seen in the area so prepare your cameras. Later in the evening, you will have dinner and your overnight stay at the lodge. After breakfast, you will depart Queen Elizabeth and head for Bwindi Impenetrable National Park passing Ishasha which is famous for the tree climbing lions arriving in the afternoon. Best known for its mountain gorillas, the Montane Forest also attracts spectacular birds. There are 23 of the 24 Albertine Rift endemics including the African Green Broadbill, Bar Tailed Trogon, and other beautiful forest species. After that, you are free to further explore or simply relax back in your lodging. You will spend the night at the provided homely accommodation after having enjoyed all your meals. You have to rest enough and get ready for the following day’s gorilla tracking because it will be quite challenging. The terrain you will explore will also depend on the group you will track. In the morning, you will have to wake up very early to get ready for gorilla tracking. The guide will drive you to the headquarters for a briefing before you set off in the interior of the forest. Do not forget to take your lunch boxes and all the necessary gear to track the rare mountain gorilla. It is perhaps one of the most exciting wildlife experiences on this planet. There are now only 650 of the creatures left in the world. The tracking may take between three to six hours but it is well worth the effort. For the gorilla trekking, it is important to establish rules that you are required to follow for your safety during the trip. On the way to the gorillas, a maximum number of eight visitors may visit a group of habituated gorillas in a day. This minimizes behavioral disturbances to the gorillas and the risk of their exposure to human-borne diseases. Always wash your hands before you head out to the gorillas. Do not leave trash in the park. Whatever you bring into the forest should be carried back with you. On you visit, you will be taken to where the guides left the gorillas the day before. From there, you will follow the gorillas trail to find them. Look out for the gorillas nesting sites along the way. When you approach the gorillas, the guide will inform you when to get your cameras ready. Please always keep your voices low. You will also be able to observe the great bird life and other wildlife in the forest. When you are with the gorillas, you must stay in a tight group when you are near the gorillas. Do not eat or drink while you are near the gorillas. Sometimes the gorillas charge. Follow the guide’s example, crouch down slowly. Do not look the gorillas in the eye, wait for the animals to pass. Do not attempt to run away. Running away will increase the risk of attack. Flash photography is not permitted. When taking pictures, move slowly and carefully. Do not touch the gorillas. They are wild animals. The maximum time visitors are allowed to spend with the gorillas is one hour to limit their disturbance. If the gorillas become agitated or nervous, the guide will end the visit early. After the visit, keep your voices low until you are 200 meters away from the gorillas. You are also required to follow these general health rules. Remember gorillas are very susceptible to human diseases. The following are ways to minimize the risk your visit might pose to them. Respect the limit imposed on the time that visitors are allowed with the gorillas each day. This minimizes the risk of disease transmission and stress to the group. If you are feeling ill or you have a contagious disease when you are already in the park, please volunteer to stay behind. An alternative visit will be arranged for you or your money will be refunded as per gorilla reservation guidelines. If you feel the urge to cough or sneeze when you are near the gorillas, please turn your head away and cover your nose and mouth in order to minimize the spread of bacteria or viruses. If you need to go to the toilet while in the forest, please ask the guide to dig you a hole and ensure that you cover it when you have finished. Any breach of those rules may lead to termination of gorilla trekking without any refund. There are always park guides with you who interpret the flora and fauna and the lifestyle of the gorillas. The rain forest is spectacular as it offers a dramatic, heavily forested, and dense landscape crisscrossed by numerous animal trails, allowing access for tourists. Recorded mammals there include the endangered mountain gorilla, the rare golden monkey, the buffalo, elephant, black-fronted duikers, bushbucks, leopards, giant forest hogs, as well as other animals. After an early breakfast, you will drive to Lake Mburo National Park and enter the park through the Inshara Gate, arriving in the afternoon. Go for an evening game drive. Lake Mburo is an extension of the northwestern Tanzanian plains and eastern Rwanda with big herds of zebra, impala, eland, and other savannah mammals. For bird lovers, this is one of the best places to find the African Fin foot, Papyrus yellow warbler, Papyrus gonolek, Bush shrike, Brown-chested plover, Southern-Ground hornbill, Spot-flanked, and many others. Get to enjoy your overnight stay in a full-board accommodation. You will have your morning breakfast and then go for a game drive. You will come back to the lodge for lunch and then later in the afternoon, you will go for another game drive or for the boat trip on Lake Mburo. Have a good night's sleep and bring the wonderful memories of your safari in preparation for your flight the next day. After morning breakfast, you will drive to Kampala. Given the time for your flight, you can visit the craft center and later drive to the airport to catch your flight back home. On your third safari day, you will go for a boat trip to the foot of Murchison Falls as well as an afternoon boat trip along the Kazinga Channel on day seven. There you will have the chance to view the inhabitants along the river as a change of scenery from the savannah. A guided walk through the Bigodi Swamp will also be included on day five of your safari. You will have an amazing opportunity to ardently absorb your surroundings and learn more about them during this activity. This safari will take place at Ziwa Rhino Sanctuary, Murchison Falls, Kibale National Park, Queen Elizabeth National Park, Bwindi Impenetrable National Park, and Lake Mburo National Park. Ziwa Rhino and Wildlife Ranch located in Nakasongola District is the proud home of the only wild rhinos in Uganda. The Rhino re-introduction project is a project of Rhino Fund Uganda and Uganda Wildlife Authority. They are conveniently located 176 kilometers north of Kampala on the Gulu highway towards Murchison Falls. Ziwa is the only place where you will be able to see rhinos in the wild. Presently the sanctuary is home to 19 southern white rhinos. The sanctuary has become increasingly popular with tourists for rhino trekking, bird watching, nature walks, and relaxation. Murchison Falls Conservation Area comprises of Murchison Falls National Park, Bugungu, and Karuma Falls Wildlife Reserves. This is where the Nile explodes through a narrow gorge and cascades down to become a placid river whose banks are thronged with hippos and crocodiles, waterbucks and buffaloes. The vegetation is characterized by savannah, riverine forest, and woodland. Wildlife includes lions, leopards, elephants, giraffes, hartebeests, oribis, Uganda kobs, chimpanzees, and many bird species. The Murchison Falls, also referred to as the Kabarega Falls, is a waterfall found on the course of the great Nile. It actually breaks the stunning Victoria Nile that flows across Uganda’s northern region from the vast Lake Victoria to the deep Lake Kyoga and continuing to the northern tip of Lake Albert within the western arm of the great East African Rift. Right on the peak of the Murchison Falls, the waters of the Nile force their way through a small slit within the rocks which is just seven meters and topples to 43 meters below with a thunderous roar forming a residual water stray that forms a beautiful rainbow. The view is very breathtaking! From there it then continues its westward into the stunning Lake Albert. Kibale National Park contains one of the loveliest and most varied tracts of tropical forest in Uganda. Forest cover, interspersed with patches of grassland and swamp dominates the northern and central parts of the park on an elevated plateau. The park is home to a total of 70 mammal species, most famously, 13 species of primate including the chimpanzee. It also contains over 375 species of birds. Kibale adjoins Queen Elizabeth National Park to the south to create a 180-kilometer long corridor for wildlife between Ishasha, the remote southern sector of Queen Elizabeth National Park, and Sebitoli in the north of Kibale National Park. The Kibale-Fort Portal area is one of Uganda’s most rewarding destinations to explore. The park lies close to the tranquil Ndali-Kasenda crater area. It is within half a day’s drive of the Queen Elizabeth, Rwenzori Mountains, and Semuliki National Parks, as well as the Toro-Semliki Wildlife Reserve. Kibale National Park contains one of the loveliest and most varied tracts of tropical forest in Uganda. Queen Elizabeth National Park is located in western Uganda. Shared by districts of Kasese, Bundibugyo and Bushenyi, Queen Elizabeth park is 1,978 square kilometers in size. The park lies five to six hours from Kampala on a surfaced road via Mbarara and can be reached on a dirt road from Bwindi. It includes parts of Lakes Edward and George which are linked by Kazinga Channel and other attractions. You can access the park from Kampala either on tarmac through Mbarara or Fort Portal via Kasese. The Uganda safari park can also be reached via Ishasha sector, which is south of Bwindi Impenetrable National Park. The park has a variety of flora and fauna and it is acknowledged to be a habitat for over 95 mammal species with about 612 species of birds. The various species in the park has made it unique and most liked by tourists. Geographers will say that the park has around 57 vegetation but in actual sense, it has five levels of vegetation namely bushy grassland, Acacia woodland, Lakeshore, or swamp vegetation along with forest grassland. The grasslands of the park settles wildlife such as Cape buffalo, Uganda kob, waterbuck, warthlog, lion, leopard, hyena, giant forest hog, as well as elephants. Bwindi Impenetrable National Park is located in the southwestern part of Uganda on the rim of the Rift Valley. The hillsides which are mist-covered are sheltered by one of the ancient and very biologically varied rain forests in Uganda that dates back to more than 25,000 years, comprising of about 400 varied plant species. More notably, the impenetrable forest in protects a population of 320 mountain gorillas, approximately half of the population in the world. Among which are a number of habituated groups, that can be tracked by visitors. In addition to the endangered impressive mountain gorillas, there are also 346 bird species and more than 200 butterfly species, about 324 species of trees, ten of which are only found in this areas in the whole of Uganda. The biologically varied region offers shelter to an additional 120 mammals, among which are various primate species in addition to elephants as well as antelopes. Lake Mburo National Park is a compact gem, located conveniently close to the highway that connects Kampala to the parks of western Uganda. It is the smallest of Uganda’s savannah national parks. It is home to 350 bird species as well as zebra, impala, eland, buffalo, oribi, Defassa waterbuck, leopard, hippo, hyena, topi, and reedbuck. Together with 13 other lakes in the area, Lake Mburo forms part of a 50-kilometer-long wetland system linked by a swamp. Five of the lakes lie within the park’s borders. Once covered by open savanna, Lake Mburo National Park now contains much woodland as there are no elephants to tame the vegetation. In the western part of the park, the savannah is interspersed with rocky ridges and forested gorges while patches of papyrus swamp and narrow bands of lush riparian woodland line many lakes. During this safari, all meals will be provided for you by Afrikan Wildlife Safaris except for the first and last days in which only breakfast will be served for your meals. On your eighth safari day, you may decide to relax in the afternoon or take a nature walk at an extra cost of 20 USD which will lead you to the Munyaga Waterfall and a chance to see primates such as the Grey-Cheeked mangabey, blue monkeys, and others species. On your last safari day, the team will drive you to Kampala. Given the time for your flight, you can visit the craft center before catching your flight back home. Please book your flight to arrive at Entebbe International Airport (EBB). Transfer from and to the airport is included. Afrikan Wildlife Safaris will pick you up from the airport. Air Uganda offers a domestic service to some of the major towns. Air Charter is also available. Usually you will be required to pay for flights in hard currency. Afrikan Wildlife Safaris is your specialist in the African wildlife safari and culture with a wide range of coverage adventuring in 12 countries in Africa. Cancellation must be made in writing to Afrikan Wildlife Safaris Ltd. Land prices and subject to the following cancellation charges based on a number of days before the departure date. 300 USD for ,ore than 60 days, 50% between 20 to 59 days, and 100% for less than 20 days. There is no refund for any unused portions of the tour program once tour has commenced. For late booking, fees of 150 USD for additional communications, faxes, and instant mail costs may apply if reservations are made between 20 to 60 days prior to the date of departure. A fee of 100 USD per booking for each change on revisions made 60 days prior, 59 days, or less, cancellation charges may apply.